@mistergenie I think we've seen enough previews and now it's finally Saturday, MR.SUNSHINE Day! We can only hope that those clips shown all week will not be all that we'll see later. Exciting.. yes! Distressing.. not so much! Well, maybe a little. Happy mode.. +ve mood.. Happy MR.SUNSHINE Day! Well.. we could see it this way.. the drama doesn't end too soon on the 22-23/9 weekend. It's unavoidable because on Chuseok, there'll be special festive programs and movies screened on tv. Netflix has the remaining episodes on 9/15+16 and 9/29+30. tvN will air a special director cut Chuseok episode "Guns, Glory, Sad Endings" of unaired scenes, previews of E23-24, reviews of E1-22, and highlights on 9/22 9pm. They also plan to air reruns during Chuseok holidays (9/24-9/26). Geographically speaking, it does make more sense for him to travel to SF. However, I think KES, PD, or production team went for the visual route and wanted to showcase the iconic Brooklyn Bridge (construction period: 1869 - 1883), which fits better for the storyline's time period. The Golden Gate Bridge in SF didn't exist until the 1930's, and there would not have been any iconic landmark to show. Tere was someone in DB who mentioned about the inaccurate portrayal of the bridge here, because it took 14 years to complete and would not look nearly completed when Eugene arrived in 1871. The Brooklyn Bridge is gorgeous, and Eugene's silhouette is a bonus! As for the other locations that you've mentioned, I think it's best to treat this drama as a fiction and just enjoy it as is, without having to wrack our brains out. 1871 Battle of Ganghwa. The Asiatic squadron warships were stationed in the New York, Boston, Baltimore Navy Yards so it makes sense that they returned to the East Coast passing by Brooklyn bridge. The warships left Korea to China to guard the region before returning to US. I think this is when Eugene came along as a 6 year old stowaway as the ships returned to their yards sometimes after this, may not be 1871. 1869 - 1883 Brooklyn bridge finished in 1883 but it was several years along when Eugene saw it. The picture is a little farther along, here's one in 1872. 1900-1901? Eugene came back to Joseon in his late 30s. The silhouette of the finished bridge behind him is correct. The production has other issues and inaccuracies but as far as I know, it's not too far off. Could be wrong with Eugene's date a little. This drama is so bad for my health, and now they have to prolong the anxiety for another 2 weeks. At least I am getting 1 weekend back to do the things I am supposed to do since July while waiting for the epic ending (sad ending...not). Thanks all for your posts. I’ve really enjoyed all your POV and insights. 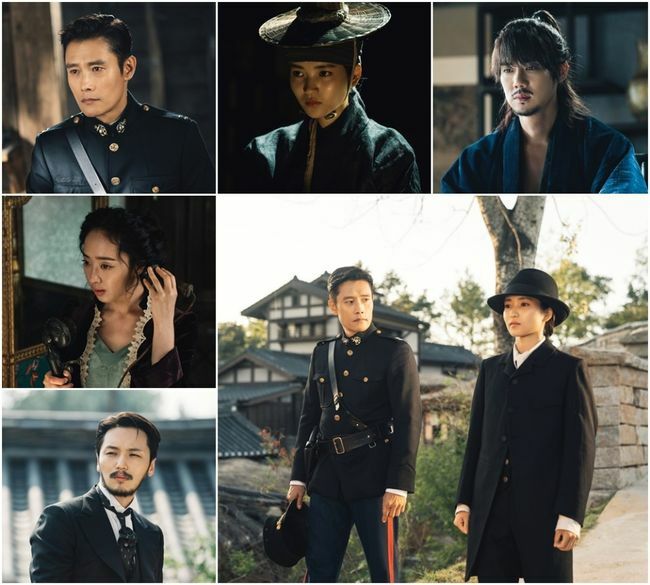 I am curious what other dramas do you watch in addition to Mr. Sunshine? I started 100 day prince but so far it has not really charmed me yet. I need to distract myself with something else after this week, otherwise I will keep thinking about what-ifs and sad ending. At this point, considering the direction of the drama, America ain't happening. It only ever was a futile hope. The bare optimism that I can scrounge at this point, is holding a teeny tiny bit of hope for some kind of future for EC/AS in Shanghai. Otherwise, all available signs portend doom(for the character/s) and gloom (for us , the viewers). Well.. we could see it this way.. the drama doesn't end too soon on the 22-23/9 weekend. It's unavoidable because on Chuseok, there'll be special festive programs and movies screened on tv. MR.SUNSHINE wasn't affected by the Asian Games before, unlike other dramas, it was not postponed although ratings dropped a bit. So.. this the time to test the 'patience' of viewers.. in the cruelest way possible. I also thought the same. That there is a possibility that Eugene will return to America and return to Joseon again. The only thing is how long is it before he returns and where is Ae Shin in all this? Looks like the last OST to be released is the one below by Hwang Chi Yeul. It had been played twice and both times, it was at a loved one’s funeral. I am dreading the next time this is played. But it is a beautiful song. Aigoo, you should just go out and celebrate your birthday that day. But who am I to say, I think I am worse since I have been staying home and avoided going out on Sat and Sun ever since Mr Sunshine started airing. I am only watching Mr Sunshine and nothing else. Being busy in real life and also kinda lost interest in watching dramas these days, I don’t watch much nowadays. Mr Sunshine is special and had caught my interest ever since Kim Eun Seok talked about it last year. I also thought the same. That there is a possibility that Eugene will return to America and return to Joseon again. The only thing is how long is it before he returns and where is Ae Shin in all this? Looks like the last OST to be released is the one below by Hwang Chi Yeul. It had been played twice and both times, it was at a loved one’s funeral. I am dreading the next time this is played. Hi sorry to cut your post. HCY fans are worried too, that his OST has been played during "sending offs" for beautiful souls. Hopefully the next time the song is played, it will be for a scene depicting separation, rather than death. I'm looking for something in this desolate field. I know a beautiful smile to wash all of them off. Takashi in Eugene's room? Still looking for the music box or the owner(s) of the music box? Obviously, he's pretty obsessed with both. But it may be that he sensed AS was there? @burningpotato @charray When I said going to America ain't going to happen I meant it for Ae Shin. I do agree with both of you that there's a very high probability of Eugene going back to America after this Japan mission.Heck, I am not even sure he will accompany AS to Shanghai - have a feeling they will part ways in Japan. The time period covering this drama is up to 1905 and it is currently Feb/March 1904 in the drama - so another separation, another time jump is a definite possibility. Thanks for those pics. Does this confrontation happen immediately after Ae Shin leaves? Maybe. But it could also be part of another unrelated scene much later on in the episode. 4. [+3031, -31] I feel like they did even worse than that.. Even with the comfort women.. This is why I don't want to get close to Japan..
1. [+1112, -18] I cried while seeing Haman-daek standing up to them while holding a rock but collapsing with one shot of a bullet because that's the image of our grass roots during that era. There was a time where they didn't put Korea-Japan issues in dramas because they thought it wouldn't be exported.. I feel like there isn't a greater history book than this.. Writer Kim Eun Sook is amazing. Original Source (OSEN via Naver): 'Mr. Sunshine' Kim Tae Ri kills Kim Eui Sung and starts revenge..Tells Lee Byung Hun, "Let's go to America"
3. [+2873, -76] You all gave yourself trouble while watching it live. Now go rest. I'm telling you because I think you might've forgotten but tomorrow is Monday. I'm sorry for bringing up these sad words. 1. [+1651, -42] This is a drama I hope many people will watch..
5. [+479, -19] This is forreal a masterpiece drama!! A drama that comes out once every 10 years!!! A LOVE CONFESSION + A MARRIAGE PROPOSAL + A RING + A NEW NAME !!! The scene of AS and EC in the train coach that we saw so many times in the preview. It's really a beautiful scene as she put the ring on his finger. Simply beautiful. I have been taking a sneak peek at the instagram spoilers and some of the scenes are already making me cry. Such amazing scenes of love but shrouded in pain and heartbreak. Ugh!! My heart is going to go through a full range of upheavals when I watch later with subs. Edit: Dear Show, you yourself take a look at this freaking amazing emotional scene between Dong Mae and Hina and ponder on why you wasted so much of Dong Mae's screen time on his AS obsession when it could have easily gone into developing DM/KN more. Edit 2: This episode is a testament to how any show can be elevated from good to great just by having the main leads interact more and get into situations together. Not sure what happened.. everything went so fast. Some honeymoon that was for Mr. & Mrs. Choi. Contrary to what's been discussed before, EC never wanted to abandon/lose his military/consul position but there're consequences to his actions with AS. Will they find out that he killed TM? One thing seems sure.. Eugene became like his father-in-law..
hope he doesn't end up like his father in law.